Love it! You are precious, Henry. I can't be silent any longer. This blog is a fraud. I've met this dog. And you know what? He is not that cute. The truth is that Henry (if that IS his real name) is at least 10 pounds heavier than he appears in these pictures and has a stringy coat, buck teeth, and cankles. Also, he smells like Cheetos & wet laundry. These pictures are obviously airbrushed. The pushy, ruthlessly ambitious dog owner behind this site is clearly aiming to parlay these Photoshopped pictures into a movie career for this alleged Cavalier King Charles Spaniel and couldn't care less about the damage she is doing to impressionable puppies. We need to protect our young dogs from these completely unrealistic standards of beauty that they can't possibly live up to. Henry, you're gorgeous!! We love reading your report with lots of great photos from Austin. We're glad you had a pawsome time with another gorgeous doggie Leo. We're looking forward to read your update. ps: We actually wanted to email you but we don't know your addy. The 2nd comment is NOT nice at all. We do not understand why this Anonymous said such thing. (if you don't like the blog, don't bother to come by!) It's heartbreaking... Hope you and your mom are doing well. Love it! Wilbury, Tilly and Billy the Big Dogs, in the growing City! definately want to meet Henry! You got star quality my boy!! The gals are swooning over here. Hello Henry- a gorgeous one!! You must be busy being chased by all your fans. :) We wanted to stop by and say hello! :) :) We're looking forward to your update and photos....... soon. You are one gorgeous boy! Your hair is so shiny! I just love reding about your adventures. all cavs are gorgeous - it's true! although you do look rather striking in that pose henry! well done! We just added you to our Cavalier Blog List! i just found you and read through the older posts, I was laughing the whole time! Henry is such a funny guy! Of course I am partial to tri's, but i I really think he is gorgeous! A new section has appeared on our blog: Baika's Blog, which is named after our little dog. It's called "what's new with the CKCs ?". An automatic list of the 10 most recent updates of a selection of CKC blogs from around the world. From now on in one glance all visitors can be kept informed of the news in the Cavalier King Charles world. Any CKC blog owner can participate by giving us the link to their blog. Whenever there is a new posting the link to your blog will be shown in the list. We of course would appreciate if you could add a link to our blog in return. CKC blogs of all languages are welcome. We'll add a mention next to each blog if it's in French (FR) German (DE) or in English (EN). We hope this new tool will reveal itself as practical and interesting for you as it is for us. For what reason my computer does not register the other computers within the network? That is an absolutely great glamour shot of the beautiful puppy. Henry is a really handsome guy. 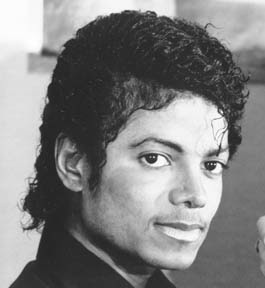 The Michael Jackson look, from the best part of his career, is a very interesting look to aspire to. I wonder if Henry will ever pick other singers, like John Lennon, to base his look on in the future.